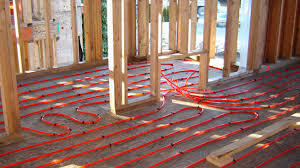 Radiant heating systems are gaining more popularity throughout the residential world. Not only can they provide heat throughout the entire home, but it can effectively and efficiently provide the warmth and comfort that you wouldn’t be able to get with other systems. Due to this, many homeowners are looking to make the switch. These systems are usually running through a hot water heater or a boiler. The heat is sent through pipes that are running usually throughout the floors but can be placed in other areas of the home. The heat then rises to heat the rest of the room that the system is in. These systems are often used to heat flooring in colder bathrooms or outside rooms. The tubing that is usually used in these systems is plastic and known as PEX. They’re safe to use and rated for the heating systems, providing you with warmer, more efficient air flow throughout the home. This also helps with heat loss through open areas that the ducts in the home might have had previously, saving you money in your energy bills. This is another reason for a homeowner to make the switch to a more cost-effective method to heat their home. Many people find that these flooring systems are more effective at heating many areas of the home and they make them much more comfortable. When making the switch from your current heating system to a new one, it is important to hire a professional that is going to provide the installation for you. They understand how the heating system works and how to ensure that the job is done right. Contractors Today has the latest news and information on the local radiant heating and cooling contractors that you need to find locally. Fill out our form below or give us a call today to learn more about these contractors.